Deep in the ground men battle for the riches of the abyss. 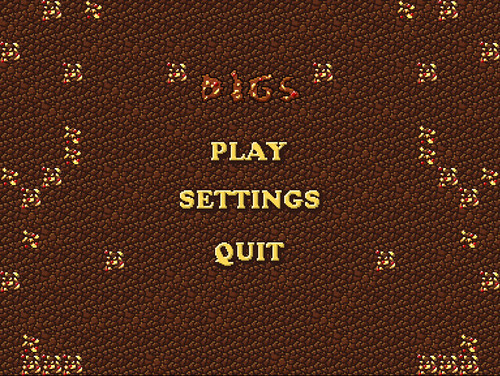 I present to you a game in which you dig for gold, or to crush your opponent. Features player on player action or a computer enemy to hone your skills. Default controls are arrows for player 1 (player on the right side of the screen) and wasd for player 2. Options and controls can be set in-game. ninja edit: Windows version is up, I'm out for bed, hope it works on everyone's computer. Top post edited with the new links, hope you enjoy it and be sure to drop a line after you've played it! Finally got to updating my half-assed top post. Ok, we tried this the other day. At first we thought it was just a kind of neat most-efficient-path wins game. But it's actually more interesting, because you have to balance an efficient path with maneuvering to bury your opponent and not get buried. We didn't know gravity was going to effect free standing dirt and it took us a little while to figure out why we were getting crushed. Love the music. Reminds me of In the Hall of the Mountain King. 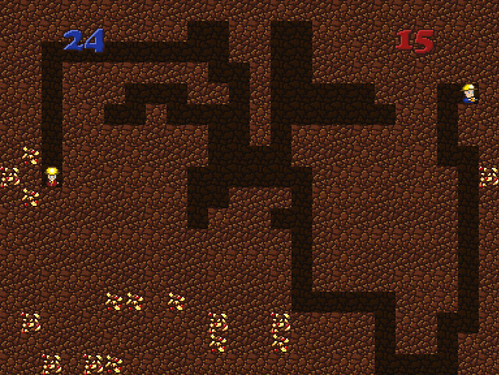 I think the people I was with were a little turned off by the degree of similarity in the visuals to Spelunky. Which is too bad. The art is really well done! It all fits together well. It just comes off as a Spelunky clone. The message it sent us was, "Like a cheap knockoff of your favorite name brand, I am inferior in every way to the original you know and love. My gameplay is going to be just as unoriginal." Which couldn't be further from truth. You've got some really interesting and unique gameplay! You just need graphics to match it. And I know you can do it because the pixel art is really good! Well, that was our impression anyway. Thanks for making the game! Thanks for the kind words! I'm glad you enjoyed the game. I must admit that art is the facet of game-making I'm least comfortable with and that I did draw heavily on Spelunky.